Elevation model 10 m depicts the elevation of the ground surface of the whole of Finland in relation to sea level. Its grid size is 10 m x 10 m and the accuracy of elevation data 1.4 metres. The product belongs to the open data of the National Land Survey of Finland. More information: Topographic data and how to acquire it http://www.maanmittauslaitos.fi/en/maps-and-spatial-data/expert-users/topographic-data-and-how-acquire-it. Hillshade is a raster dataset visualising the elevation of the terrain. There are five product versions available in which the pixel sizes are 2, 8, 32, 64, 128 and 512 metres (old versions in PNG format and pixel sizes 10, 40, 80, 160 and 640 metres are still available through 2016). Pixel size 2 m has been produced of the dataset Elevation model 2 m and it does not cover the whole of Finland. The other sizes have been produced of the dataset Elevation model 10 m and they cover the whole country. The material does not contain elevation values; it is a greyscale image that visualises the direction and steepness of hills. The product belongs to the open data of the National Land Survey of Finland. More information: Topographic data and how to acquire it http://www.maanmittauslaitos.fi/en/maps-and-spatial-data/expert-users/topographic-data-and-how-acquire-it. Laser scanning data refers to three-dimensional point-like data depicting the ground and objects on the ground. Each point is provided with x, y and z coordinate information. Laser scanning data is collected i.a. in order to produce elevation models and collect information about forest resources. Currently laser scanning data is available only from certain parts of Finland. Laser scanning data belongs to the open data of the National Land Survey of Finland. All laser scanning data is available as a version where the points that represent the ground surface are automatically classified. Part of the laser scanning data is available as a version where the points that represent the ground surface are classified with the help of stereo models. Both versions are available from the NLS File service of open data. The product belongs to the open data of the National Land Survey of Finland. More information: Topographic data and how to acquire it http://www.maanmittauslaitos.fi/en/maps-and-spatial-data/expert-users/topographic-data-and-how-acquire-it. 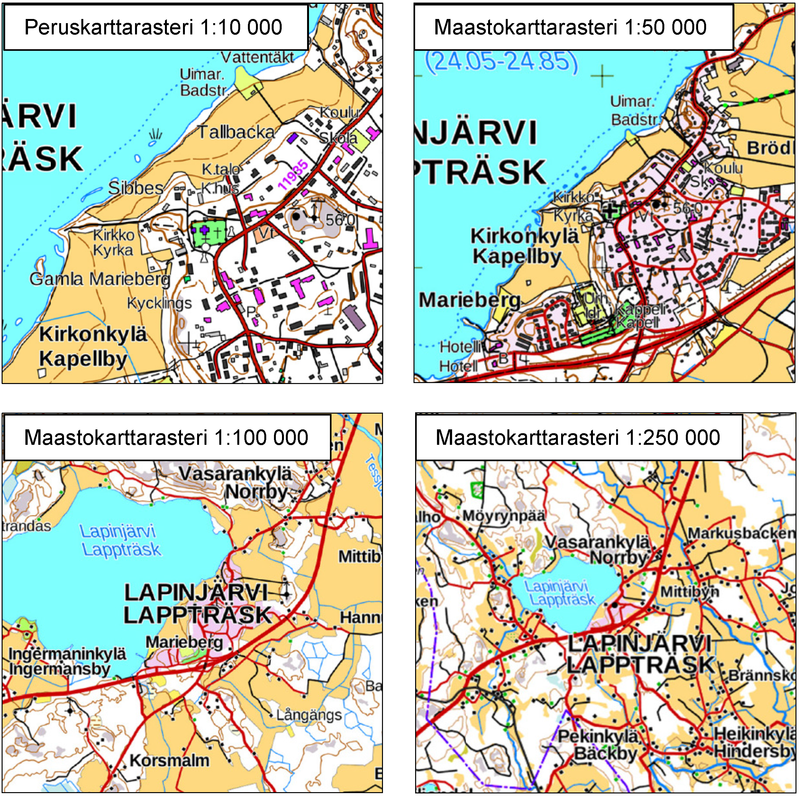 Control points and their coordinates and elevations define in practice the reference system for coordinates and elevations used in Finland. The NLS benchmark register contains information about nationwide control points and benchmarks. 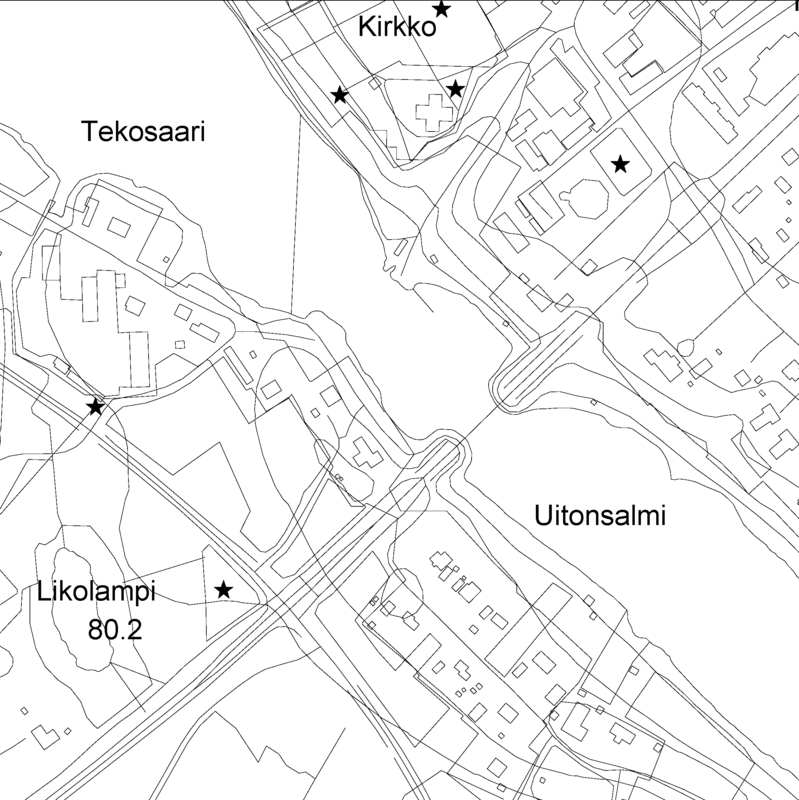 The marks are mainly horizontal and elevation control points in classes 1–3 measured by the National Land Survey of Finland. The product belongs to the open data of the National Land Survey of Finland. More information: Topographic data and how to acquire it http://www.maanmittauslaitos.fi/en/maps-and-spatial-data/expert-users/topographic-data-and-how-acquire-it. Elevation zones is a raster dataset that visualises elevation of the terrain. The product covers the whole of Finland. There are four product versions available in which the pixel sizes are 32, 64, 128 and 512 metres. The dataset does not contain elevation values; it is a colour image that visualises the height of the terrain above sea level as zones. The product Elevation zones is available as a version that covers the whole country and as versions that cover a certain area. The product belongs to the open data of the National Land Survey of Finland. More information: Topographic data and how to acquire it http://www.maanmittauslaitos.fi/en/maps-and-spatial-data/expert-users/topographic-data-and-how-acquire-it. The Topographic database is a dataset depicting the terrain of all of Finland. The key objects in the Topographic database are the road network, buildings and constructions, administrative borders, geographic names, land use, waterways and elevation. Aerial photographs, scanning data and data provided by other data providers are utilised in updating the Topographic database. The updating is done in close cooperation with the municipalities. Field checks in the terrain are also needed to some extent, mostly as regards the classification of features. The topographic database is used in the production of other map products and in various optimisation tasks. The product belongs to the open data of the National Land Survey of Finland. More information: Topographic data and how to acquire it http://www.maanmittauslaitos.fi/en/maps-and-spatial-data/expert-users/topographic-data-and-how-acquire-it. The themes of the Topographic database and Topographic map raster series (scale 1:10,000) have been compiled into seven theme entities, theme rasters, required by the Inspire directive: hydrography, elevation, traffic network, land use, land cover, place names and buildings. In addition to the above, the theme rasters also include the municipal division, road names and map sheet division as separate themes. The theme rasters have not been implemented according to the imaging technology defined in the Inspire directive. They will be produced later. The product belongs to the open data of the National Land Survey of Finland. More information: Topographic data and how to acquire it http://www.maanmittauslaitos.fi/en/maps-and-spatial-data/expert-users/topographic-data-and-how-acquire-it. The Arctic SDI Geoportal provides access to geospatial data and services available via the Arctic SDI to support and facilitate monitoring, management and decision making, and support sustainable development in the Arctic. Specifically, the Arctic SDI Geoportal facilitates the discovery, visualization, evaluation, download and integration of geographic data from a variety of sources for the Arctic. The Arctic SDI Geoportal is the result of cooperative efforts between the National Mapping Agencies (NMAs) of the eight Arctic Council Member countries - Canada, Denmark, Finland, Iceland, Norway, Russia, Sweden and the United States. 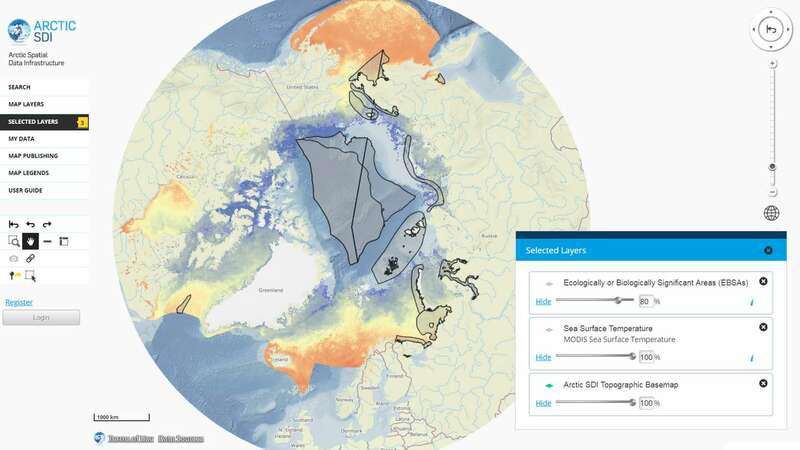 The Arctic SDI Geoportal includes reference data (such as the Arctic SDI topographic basemap or Pan-Arctic Digital Elevation Model) and thematic data from various sources. Thematic data section includes themes such as oceans, climatology and geoscientific information. Most of the data covers the Arctic or the involved Arctic countries, but new data sources with a smaller or larger geographical extent may be accepted. The Geoportal allows searching placenames via a circumpolar gazetteer, and embedding interactive maps to any website. Some of the features require registration.